Dayton-Phoenix AC drop-in fuel pump motors are an economical, direct replacement for high-maintenance, DC motors. The simple changeover uses the same two-wire 74V DC hookup, as well as your current fuel pump adapter and coupling. Our Turbo-Lube compatible pump motors also significantly reduce shop-time giving you a cost-effective alternative. Our AC Motors fully adhere to NEMA MG-1 (Motors and Generators), Railroad, and MIL 217C standards to ensure maximum reliability and durability. We use Failure Mode Effect Analysis (FMEA) to ensure reliability and predictability. 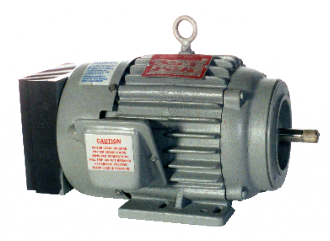 Dayton-Phoenix also offers DC fuel pump motors in .25 and .75 HP. The experience gained from producing over 40,000 units since 1939 ensures a quality motor that meets NEMA and railroad standards. The cast iron end frames and base provide superior bearing support and vibration dampening. The totally enclosed motor utilizes natural convection cooling for efficient operation in high temperatures. Our DC fuel pump motors offer easy replacement of your current motor by utilizing existing connections. Dayton-Phoenix fuel pump motors are designed to withstand high temperatures. Class H motor insulation is used to provide greater protection against extreme ambient conditions. They incorporate a unique electronic system that eliminates electrolytic capacitors and enables the motor to operate continuously in an ambient temperature of 100∞C. Dayton-Phoenix AC motors are approved for tunnel duty. Each motor must pass a high-potential capability test at 2000 VAC for one minute to ensure reliability. Our motors arrive ready to install with integral electronics that contain no potentiometers or internal adjustments. The electronics are fully epoxy encapsulated to provide isolation from the elements and ensure moisture resistance, even in high pressure wash-down situations. Product Listing for "Fuel Pump Motors" category.